Matteness personified! Embellish your eyes with extreme coverage and soft formula eye pencils that glide on effortlessly. A waterproof matte finish that provides high coverage that lasts for more than 8 hours. 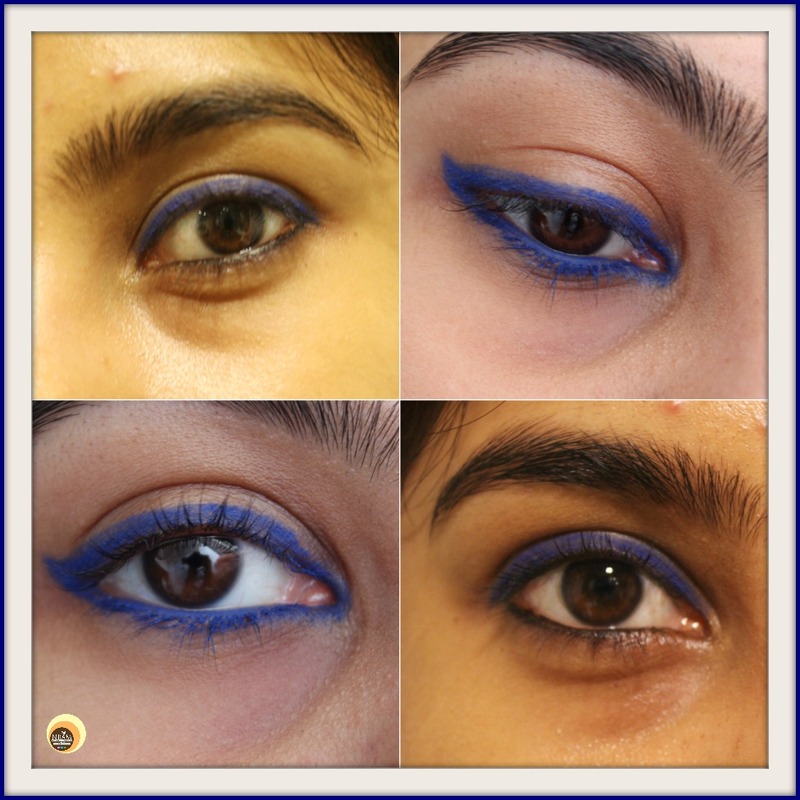 6 shades of enchanting allure that will leave your eyes asking for more. I love coloured eyeliners but till date, I have tried only two colours - blue & brown, apart from black. To be frank, I am not sure whether other colours like green or purple would suit me or not!! 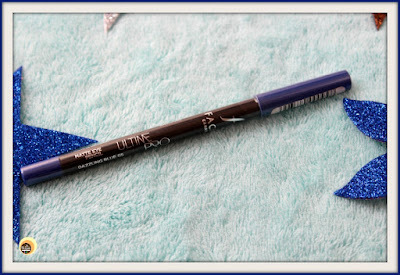 During my last India trip, I bought this blue eye pencil along with a pink lip liner (review coming soon) from the same brand Faces Canada. 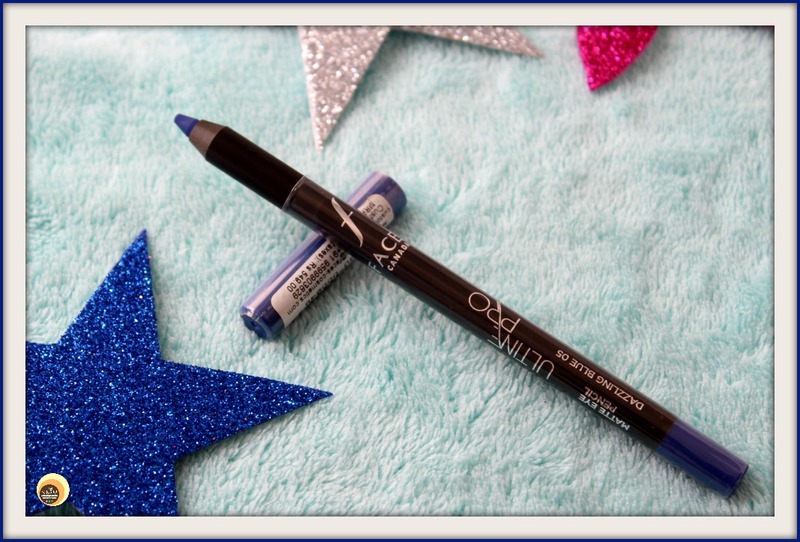 Dazzling Blue 05 eye pencil comes in a sleek, black matte finish wooden pencil form fitted with a cap. For easy identification, both the cap and the end of the pencil are blue coloured. There is no sharpener provided with this eye pencil. The black matte finish pencil body dazzles in silver print with all the product-related information. The packaging is indeed stylish, sleek and travel-friendly. 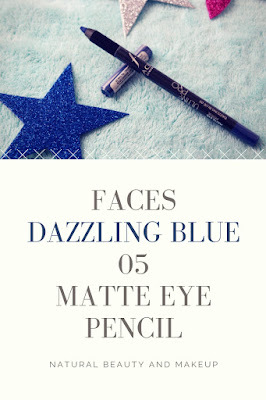 Faces Canada Dazzling Blue 05 eye pencil has a matte finish formula. The texture is creamy, smooth and is rich blue in colour. It has no artificial fragrance. 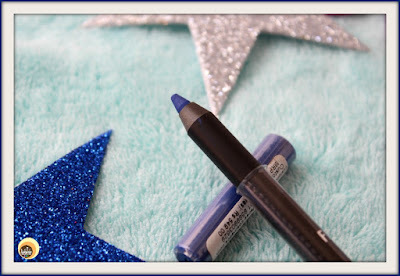 Dazzling Blue 05 shade needs at least 2-3 swipes on the lash-lines to get full pigmentation and opaque finish. In one swipe, it won’t give you the desired colour as well as gets faded away soon! The best part is it doesn’t budge or move! The colour is certainly long-lasting on the upper lids, however, on the waterline, it never stays for a long time! I love it! Faces Canada Dazzling Blue 05 is undeniably a startling blue shade with a great matte finish formula that’s Sweat-proof, Summer-proof & Smudge-proof. This liner lives up to its all claims, as for example, it would stay put on the oily eyelids for more than 8hours and is also water-resistant if not waterproof! During my recent trip from Hong Kong to Assam (India), I wore this liner on the upper lash line and it stayed throughout the journey say for more than 12 hours. I splashed water couple of times on my face to freshen up at the airport, yet the liner didn’t smudge a bit. I also wore it multiple times during my travel around the hot & humid city Abu Dhabi still it went strong and didn’t go anywhere but my eyelids!! This pencil eyeliner has a creamy formula thus glides on effortlessly providing beautiful matte finish! However, during my initial tryst with this liner, I had a harder time applying this on my eyes (the formula felt dry) but now it works great 😍. It doesn’t come with a sharpener hence I use my old Avon sharpener one to sharpen it before each use. More pointed the pencil, better the application as always!! It can be easily removed by our oldie goodie Vaseline or any makeup remover. I use Etude House Eye & Lips makeup remover to get it off! Colour stays on eyelids all day, beats humidity as well! Soft texture pencil, great for tightlining! Doesn’t irritate eyes so safe for sensitive eyes too! It goes on opaque with at least 2-3 swipes! Therefore, the product won’t last you long! Regular sharpening leads to product wastage! 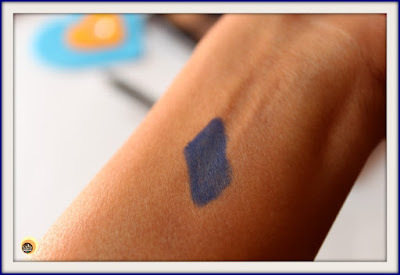 Faces Canada Ultime Pro Dazzling Blue 05 is a gorgeous, rich blue colour long-lasting eyeliner shade with a matte finish formula that will flatter all skin tones and eye types. I have brown eyes and this shade truly enhances my eyes and earns me compliments as well 😍! Overall this is perfect for those who love jet blue shade and are on the lookout for long-wear, waterproof, matte finish eye pencils. 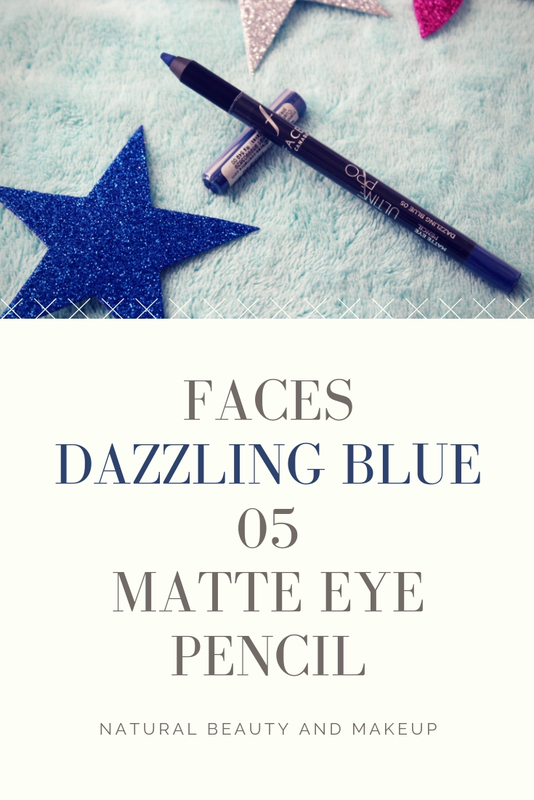 Have You Ever Tried Faces Canada Ultime Pro Matte Eye Pencil Dazzling Blue 05? If Yes, Please Share Your Experience With Us In The Comment Section Below. 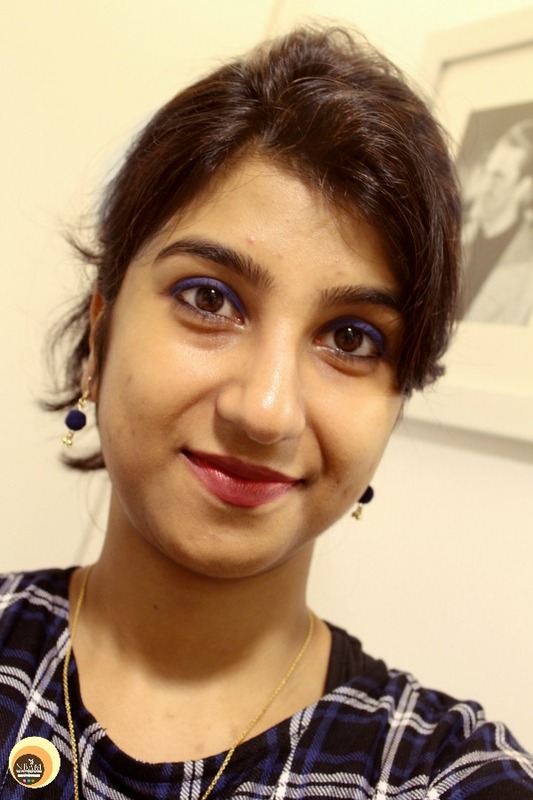 Hi, Anamika nice review, rich blue color on you looks beautiful. Such a lovely color on your beautiful eyes! I like this kind of blue for the eyes and it looks like the colour has a staying power as it didn't smudge.